Frank Camorra owns and operates a Spanish restaurant in Melbourne, Australia called MoVida. It’s wildly successful and highly acclaimed. This book, MoVida Rustica, written in conjunction with Richard Cornish is Camorra’s latest evangelistic push for Spanish cuisine. 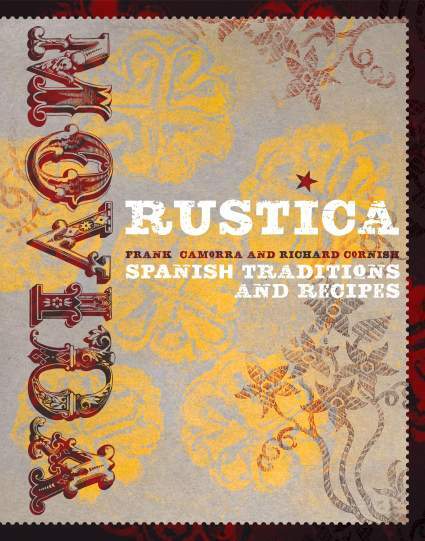 MoVida Rustica is an absorbing and captivating book, part recipe book, part travelogue, documenting Camorra’s culinary trips of discovery around Spain. Much of the food is simple and everyday, the sort of food that’s widely eaten in Spain. There should be nothing here to scare the budding amateur cook. Camorra notes that his book focuses on “the simplest form of Spanish food – food that was particularly popular at a time when Spain was poor, and had to be prepared in a manner determined by poverty”. But poverty meant resourcefulness in feeding the family. Spanish people, particularly in the country, still grow a lot of their own food – so Spanish food is also about the type of soil the food grows in, the water that is available for the food to grow, the time of year in which it is harvested and the long traditions of preparing food that stem from way back in time. I think the French call it terroir. Camorra is correct – the French do have a word for it. Terroir is almost indefinable. It captures the collision of environment, culture, place and people and describes how they mingle and interact to produce something special, something that can only be apparent when certain factors are present, when things are in line. It’s a transient state. You can’t manufacture terroir. It just happens. Camorra’s collection is rich in folklore and history. These are recipes that are handed down, passed along. They’re part of the fabric of Spanish life. The food is inspirational. There’s a chapter on the majestic Spanish ham, and what to do with it. Simplicity is best, it seems. Stuff a pan fried trout with it. 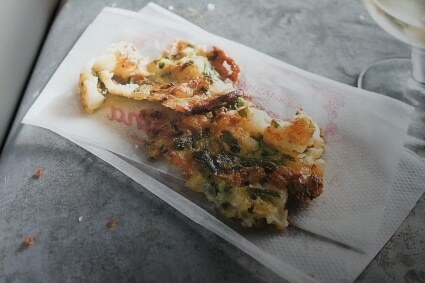 Use it in a tomato and ham sandwich, the bread toasted, rubbed with garlic and drizzled with olive oil. Lay it over huevos rotos, fried eggs and potatoes. Pastry dishes are also well represented, from a tart of puff pastry and melon to an immediately inspiring recipe for alfajores, biscuits of spiced fruit and almonds, flavoured with Pedro Ximenez sherry. 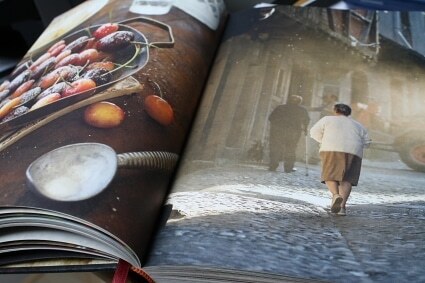 Other recipes go back to the heart of the terroir Camorra introduced at the start of the book. His recipe for cochinillo asado, roast piglet, is preceded by a tale about one of the world’s oldest restaurants, in Madrid, whose wood fired oven was first lit in 1725, the granite floor and raised hearth worn smooth by over 300 years of suckling pig and milk-fed lamb passing over them. “The old oven has seen so much human activity that it seems to have gained a life of its own,” muses Camorra. Some cookbooks are bit, you know, OK, but they don’t set the world alight, they don’t catch you. They might have some good ideas and some good recipes, some good photography and some good writing, but they never rise above the sum of their parts. You don’t find yourself sat down just reading them. MoVida Rustica isn’t one of those books. It’s exactly the opposite. It’s a book worth reading and absorbing for the sake of it, just because it’s so beautifully written and presented, just because it has heart and soul. You can feel Spain in its pages. Thanks to Murdoch Books for sending me a copy.